Saturday night was our JDRF Gala! This year the Gala was held in an aircraft hanger at a local airport. The theme was "Soaring to a Cure". This was a nod at the history of aviation in our city. It was a BEAUTIFUL night! The night was lovely and cool. The hangar was decorated beautifully. At times, the doors were slid open to reveal the planes and runway outside. Very cool! There was a live big band. The auction items were all fabulous (including the puppy - who I REALLY wanted to take home! And had she been an alert dog?!? Oh yeah - bidding would have been ON!). And we raised a decent a chunk of change for JDRF! Watching my little girl dance the night away! Sweets made a fast friend with a little girl who was also there to be a Youth Ambassador. We've met her and and her family before - but since we don't live super close we seem to only see each other on occasion. The girls, however, became inseparable Saturday night! I'm hoping we can get them together more often! Are they not adorable?!? Who could resist donating to find a cure for these two cuties?!? The girls hit the dance floor and they TORE IT UP! Us Moms hung out on the edge of the floor and laughed at our silly little girls! They were the hit of evening! They were dipping each other and twirling each other... it was so sweet! We did both end up treating lows due to the massive dancing! Of course, the dessert bars also helped keep those bg's up! The girls danced until 11:00!! Way past both of their bed times! By the end of the evening, they were practically holding each other up! But they were having so much fun! And really - this is THEIR night! This night is for THEM! All the decorations, all the food, all the fancy dresses, all the expensive auction items... it's for THEM. To help find a cure for THEM. So we let them dance! Sweets made a video for the Fund-A-Cure portion of the evening. She was sick the day we went to have it filmed. (Yes, again!) But she was a trooper! She could NOT remember exactly what to say - and the plan was to edit it out. But just watch and you'll see that the end result was just perfect! 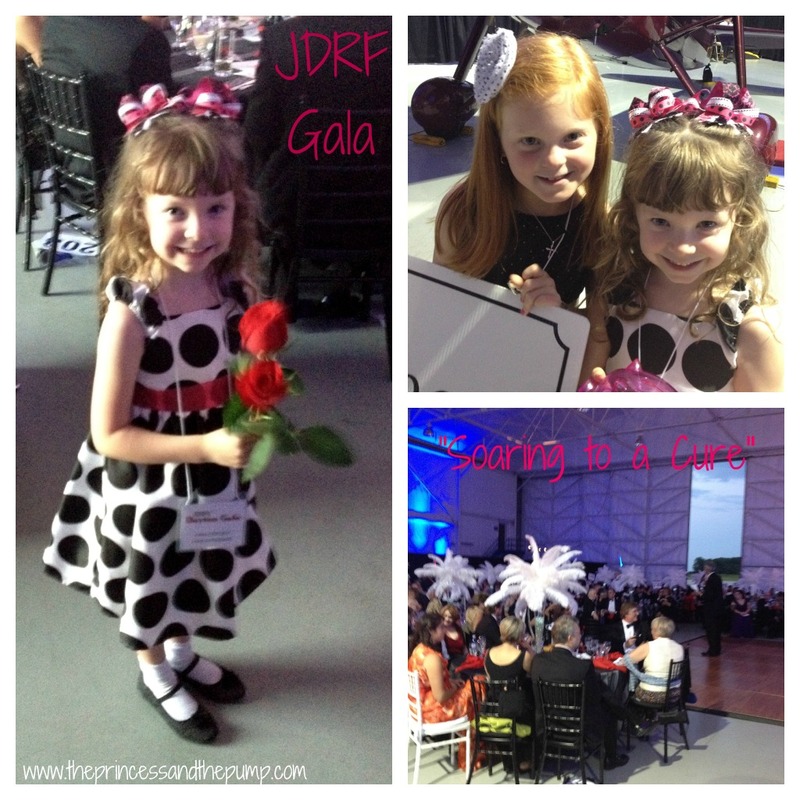 I highly encourage you to get involved with your local JDRF Gala if at all possible! I usually go as a volunteer! And it's always a blast! There is so much about diabetes that is just NOT FUN. The Gala is great way to add a little fun to an otherwise... yucky... disease! Loved Sweets in the video Hallie! So incredibly cute. I admire your tenacity and focus. Thank You from my family to yours.